and motor yachting, snorkeling, including Buck Island snorkeling tours, swimming, and SCUBA diving to riding wave runners, Jet Ski, water skiing, kayaking, parasailing, windsurfing, sailing, sport fishing, horseback riding, tennis, golf and bicycle riding. 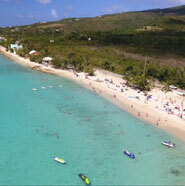 Whether you are an avid athlete or just someone that wants to enjoy a fun day in the sun and water, you will find that land and water activities on St. Croix are plentiful. St Croix has awesome water temperatures that average 80 degrees year round, making a day in the water even more enjoyable! There are many wonderful beaches on St. Croix including Cane Bay Beach, Davis Bay, Protestant Cay; Buccaneer, the Reef, Cramer Park and Rainbow Beach. There are many other spectacular and pristine beaches that you can explore and find on your own. All beaches are open to the public, even those located at the hotels/resorts. Click here for more information on St. Croix beaches. Gecko's Island Adventures - 340-713-8820 - ATV Tours & Bicycle Rentals. There are quite a few boat charters that offer Buck Island snorkeling tours. You can find full and half day trips on both sailboats and motor yachts. The beach on Buck Island is one of the most spectacular in the Caribbean and the snorkeling on the reef is fantastic.. Click here for more Sailing and Buck Island Tours information. Buck Island is a great place for all snorkelers - beginner to advanced. Many various charter companies offer a variety of excursions to Buck Island. There is also a park with picnic areas. Boats depart from the Wharf area in Christiansted or Green Cay Marina. Half and Full day tours available. Click here for more information and photos of Buck Island. The waters surrounding St. Croix are ideal for sport fishing and record size catches are common...be it Off Shore, Inshore or Flats and Shallow water fishing. Click here for more information on Deep Sea Sport fishing charters. Golfers can play three different courses on St. Croix that are all open to the public. The Carambola Golf & Country Club (a Robert Trent Jones designed course), and the Buccaneer golf courses are both 18 holes, while the Reef Golf Course is 9 holes. There is great horseback riding on St. Croix that allows riders to go past Danish ruins, rain forests and other coastal areas. More information on Horseback Riding. Kayaking the waters of St. Croix is awesome! You can glide thru mangroves, explore a lagoon, paddle out to sea and float over undersea life in a totally clear kayak. Kayaks are an eco-sensitive method of exploring the off-shore reefs and mangrove swamps that teem with colorful schools of tropical fish and spectacular coral formations. More kayaking information. St. Croix is the perfect Kite boarding and Stand Up Paddle Boarding (SUP) destination. More information on Kite Boarding and Stand Up Paddle Boarding. SCUBA diving aficionados consider St. Croix to have some of the best scuba diving in the Caribbean, largely because of its spectacular wall diving, canyon dives and some great wrecks to dive on. More information on SCUBA Diving on St. Croix. If you want to play some tennis while visiting St Croix, there are several options. Some resorts have there own tennis courts and there are several public tennis courts around the island. Click here for tennis court locations. Looking for a little excitement during you visit to the island? Why not rent a Wave Runner / Jet Ski and have some fun zipping along the warm clear Caribbean waters. More information on wave runners and jet ski rentals.